Six goalies who left their stamp on the game can now be found in your mailbox. 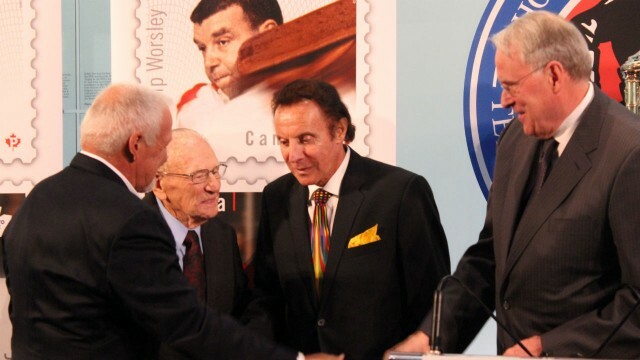 Canada Post unveiled their Great Canadian Goalie stamps on Thursday October 1. The limited edition stamps feature Bernie Parent, Johnny Bower, Lorne “Gump” Worsley, Tony Esposito, Ken Dryden, and Martin Brodeur. All living honourees were in attendance except for Brodeur, who is in St. Louis working for the Blues. Worsley, who passed away in 2007 at the age of 77, was represented by his family.